SINGAPORE - When it comes to women's representation in leadership, Singapore still lags behind many developed economies. 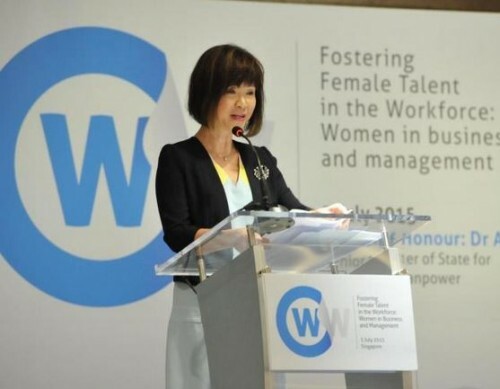 Senior Minister of State for Manpower and Health Amy Khor on Friday called on the public and private sectors to better support women moving up the corporate ladder. The public sector needs to promote an environment in which it is easier for men and women to juggle career and family commitments, said Dr Khor. The private sector also needs to adapt workplaces to support their employees' needs, and adopt human resource policies that give women fair consideration for jobs at all levels, she told a regional conference organised by the International Labour Organization (ILO) Bureau for Employers' Activities and the Singapore National Employers Federation. Women hold just nine per cent of board seats here, an improvement from 8.3 per cent in 2013 and 7.9 per cent in 2012 but behind the global average of 12 per cent, noted Dr Khor, citing a recent Deloitte Global report. "Prioritising the development of female leaders is not about striving to appear fair and equal. It is not merely a female issue, nor should it be seen as affirmative action for women. "Rather, it is about expanding and optimising limited talent pool in any organisation," she said, speaking to some 250 local and foreign company representatives at the Holiday Inn Singapore Atrium hotel. The Tripartite Alliance for Fair and Progressive Employment Practices will launch a work-life resource portal next year to help workers and bosses better understand ways to implement flexible work arrangements, added Dr Khor, without providing details. Ms Deborah France-Massin, director of the Bureau of Employers' Activities, also presented an ILO report which showed that a gender pay gap still exists in Singapore, with women earning 11 per cent less than men on average. In comparison, there is no gap in the Philippines but a 33 per cent gap in India. "Companies should look at policies on training in the workplace...to allow women to acquire a general grounding in management which will allow them to climb the corporate ladder if that's what they want," she said to the media on the sidelines of the event. Raising awareness about the importance of diversity is also key, said Citi Singapore's head of human resources Evangeline Chua, who was one of the panellists at the conference. "We try to profile (women) and make them more visible so that they can move up into leadership roles," she said, adding that three out of four managing directors promoted in her company this year are female. Citi has several leadership programmes which provide networking opportunities and career coaching specifically for women in the company who are keen to move up.